If you are a dedicated shooter, you know that it’s not only the steady hand or the accurate gun that gives you a clean shot. No gun, as good as it may be, it able to shoot nice and clean every single time if you don’t clean it properly (not to say when you don’t clean it at all). Every time you fire your gun, residues from the powder coat the working parts of the gun. It’s not that is much, but they do build up and this may cause the dysfunction of your gun. Actually, it’s only a matter of time until your rifle may get plugged, giving an improper spin. In worst-case scenario, the passage of the bullet may even be blocked, giving a breech explosion or a backfire. Still thinking about not cleaning your gun? The firing pin, all moving parts inside your rifle may become gummed up. Your gun wears out sooner than you’d expect and you end up going shopping for a new gun again. Along with powder residue that builds up inside your gun, dirt, dust and debris may also cause some problems. Guns are prone to collect dust and dirt when you use them. Don’t forget that juts because you don’t use your gun, it doesn’t need to be cleaned. The more you take care of your gun, the longer you’re going to have it. Therefore, getting a good cleaning gun kit is just as important as your gun per say. You may feel like it’s not worth it, but the better you clean your gun, the more reliable and durable your gun gets. A good gun cleaning kit has to come not only with patches, but also with an attachment for patches. It needs to include a good quality brush and a great gun cleaning solvent also. Any good gun cleaning kit is also easy to use and to put together. As there are so many guns out there, it’s only natural to see just as many gun cleaning kits. You may feel it’s a bit overwhelming when you take a closer look to the choices, but with few tips, choosing the right gun cleaning kit is not going to be a burden after all. When we talk about the Hoppe’s No. 9 Cleaning Kit with Aluminum Rod, it’s not only the price that stands out, but also the reliability the kit brings, considering its low price. The kit is designed and tested, which makes it a reliable option when you don’t want to spend too much bucks on it. The cleaning kit includes an aluminum rod and several good quality items. The Hoppe no.9 Gun Bore cleaner in the kit is one of the most popular options out there when it comes to remove powder, lead, metal fouling and rust. The bore cleaner is efficient, safe to use and penetrates quite fast and deeply. As for the childproof cap, well you can never be too safe when you have kids around. The lubricating oil in the kit completes the action of the bore cleaner. The high-viscosity oil is efficient and keeps the working parts of the gun nice and oiled. It doesn’t harden, gum nor expires and is pretty durable. The gun cleaning kit also includes round die-cut patches that are uniformly woven. They have good absorbency and feature pre-cut caliber and gauges. As for the aluminum-cleaning rod, we need to mention it features a ball bearing swivel handle so that you may follow the bore’s rifling. All in all, for the little money you pay, you get a pretty decent option for cleaning your gun. There are many good things we like about the Real Avid Gun Boss Handgun Cleaning Kit and only few drawbacks that make us raise an eyebrow when looking at it. The gun cleaning kit includes 2section gun cleaning rod with swivel tip that connects to a T-handle and reaches 9 inches. The rod is a heavy-duty option and an important quality of the gun cleaning kit. The kit comes also with handgun brushes and jags: .22, .357/ .38/9mm, .40 and .45 caliber phosphor bronze bore brushes. Not only the brushes have various sizes, but they are also labelled so it’s easy for you to organize and use them. The red nylon jags are good quality and dependable just as well. You may find of great use the 2 long lasting black nylon slotted tips included in the kit. As for the 50 gun cleaning patches, it’s great they come in two sizes and are decent quality also. The case is compact and lightweight, quite easy to carry around. It’s weather resistant and pretty durable. You may also like it also as it’s rattle free, which is great when carrying it around. All the items in the kit snap firmly and securely into the oil resistant tray. So everything stays in place and when you open the case, nothing spills out either. The kit is great for any handgun and comes with all patches and brushes you may need. Despite the minor flaws, we like the case for its portability, compact shape and variety of patches, rods and brushes that are included. You don’t have to be a wood fan to like the Outers 28 – Piece Universal Wood Gun Cleaning Box. The compact and small wood gun-cleaning box brings several good things on the table and some that you may not like. Still, for the money you pay, you get quite a good kit to use for your gun. The kit comes with long lasting aluminum rods that take the heavy-duty jobs. The tips, mops, brushes are good quality. They are nicely stored and organized in the nice looking wooden storage box. The aged-oak finish wood is quite catchy, if you ask us. A latch keeps everything safe and secure for transportation. We like the kit as includes universal components that may be used in various cleaning jobs, for a wide variety of rifles, handguns and shotguns. You also get the choice to make the box your own as it features custom parts organizers. You may organize access to various contents according to your needs and wants. The cleaning kit may be used for the .22-.30 cal. rifles, 9mm, 10mm and .38-.45 cal. pistols. As for the shotguns, here are the models you may use it for: 410, 28, 20, 12 and 10 gauge. Even though the pick is plastic, it’s quite good as quality and the rods are truly heavy-duty ones. The kit is a great option, especially if you are a beginner. Nevertheless, for a very good price, you still get a dependable gun cleaning kit that may be used by any beginner. As surprising as it may seem for some, when shopping for a good gun cleaning kit, Real Avid may come up quite often. This is why another great option for gun cleaning kit is the Real Avid Gun Boss Pro Universal Gun Cleaning Kit. We are very impressed with the versatility of the cleaning kit that may be used for shotguns, handguns, rifles. You may use it for your 9mm, .22, .223, 12 gauge and many other models. The brass 3 piece gun cleaning rod threads form a rugged 32-inch cleaning rod that is very dependable. 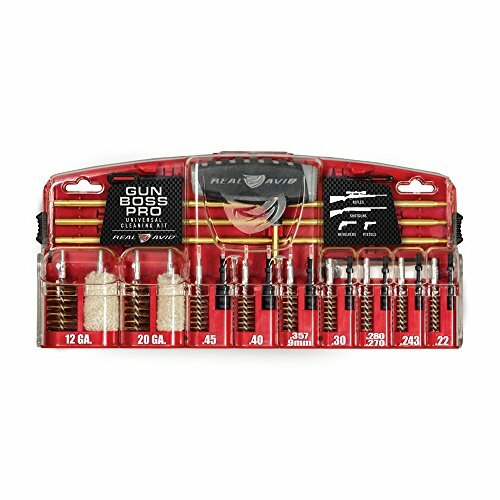 The kit includes 12 and 20 gauge brushes and mop, brushes for a great variety of calibers and nylon jags. The small and large nylon slotted tips and the 50 gun cleaning patches are also helpful and good quality. The multi-function rod handle is important to mention. The components and compartments of the kit are highly and intuitive organized. They are labeled for easier and better organization. We also need to mention the patent pending kickstand case that flips to stand and remain organized altogether. 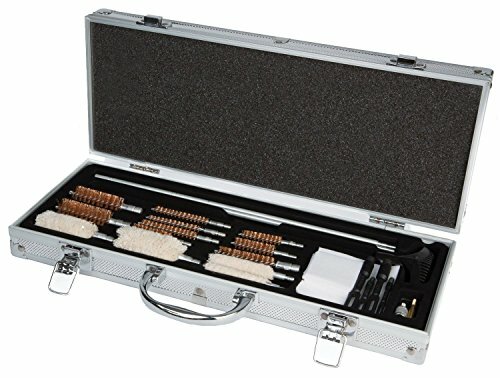 Compact and well organized, the cleaning kit within the case is a great addition to your tools. As the minor issues don’t minimize the overall quality of the cleaning kit, we still think the kit is a versatile, organized option anytime. Some manufacturers really know their business and the Hoppe’s is sure one of them. 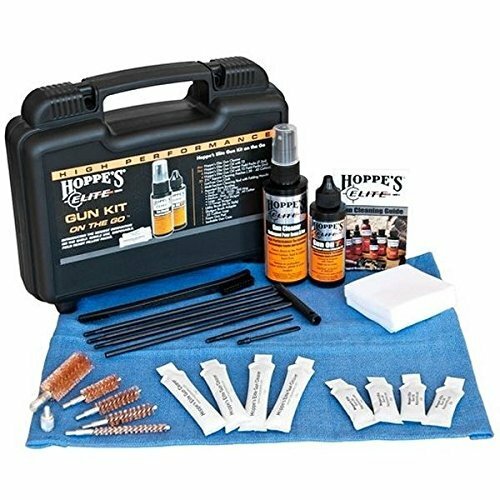 Another great gun cleaning kit from them is the Hoppe’s Elite EGCOTG Gun Care on the Go Kit that comes with way too many nice features that make us not care too much about the flaws. 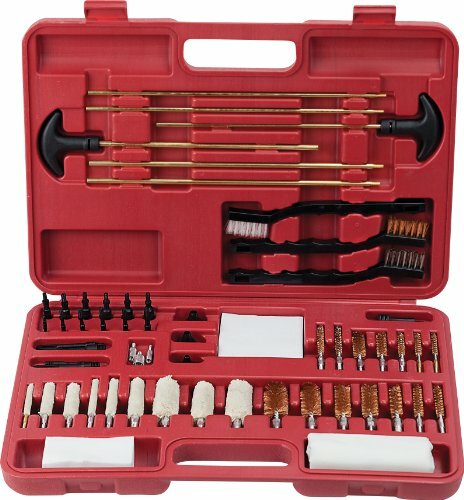 The kit includes five various bore brushes that are good quality and dependable for various jobs. You get to find in the kit one foam gun pad and one multi-section cleaning rod with folding handle and one lint-free, large and absorbent gun cloth. The cleaning kit includes all things you may need for cleaning your gun, either you are at home or out on the field. Unlike many kits out there, this one actually comes with Hoppe’s Elite Gun cleaner and Hoppe’s Elite Gun Oil, in practical single use pillow packs. In addition, the solvent doesn’t smell which is important for any cleaning kit. The gun cleaner goes deeply in the steel’s molecular pores and removes lead, carbon and most copper fouling. The gun cleaner also keeps at distance future fouling and is not only odorless, but also biodegradable, non-toxic and non-flammable. It works fast and you don’t have to spend much time on cleaning anymore. The cleaning oil has a high coefficient of friction so it spins up to 1.5million rotations per minute, which is quite fast. The square cleaning patches are uniformly woven, which makes them good absorbent. The utility brush in the kit features two bristled ends (one for the large areas and the other one for the tight spots) and you may safely scrub the surfaces, with no risk for scratching. It has a rugged design and you may use it for breeches and other jobs. The shotgun brush adapter, the 0.22 caliber loop and the foam gun pad are also found in the case. Compact and lockable, the gun cleaning case isn’t just versatile, but also very easy to carry around. Despite the minor cons, we still recommend the case as a great, versatile and useful gun cleaning kit. Are you the type of shooter (we’re not going to call names) that like all things organized in put in place, just where they belong? 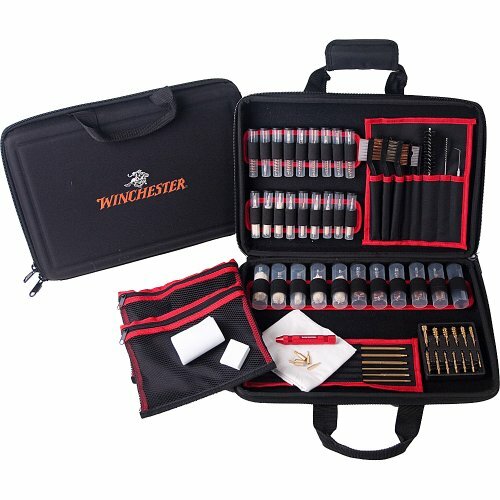 A gun cleaning kit that does more than just cleaning your gun is the DAC Winchester Super Deluxe Soft Sided Gun Care Case. The kit has been tested for its quality and is safety approved. We begin its description with the fact is designed in our USA with quality materials. Even though this may be sufficient for some, we still need to go over the details. The kit includes almost 70 pieces (68 to be more accurate) that are well protected in a soft-sided case. Once you open the case, you get to see (and use, for sure) six solid-brass rods, four slot tips, 13 solid brass spear-pointed jags and four brass adapters. The rods fits .17-.280 caliber and .30-.54 caliber, whereas the 14 phosphor bronze brushes and 14 mops may be used for many calibers and gauges also. The double-ended metal cleaning pick, the double-ended breech brushes, the 50 cleaning patches add up to the items you find inside the case. The Winchester EVA soft-sided case features functional and helpful pouches and removable bandoleer sections. The kit is a good starter kit and presents a reliable assortment of brushes attachments. It has a modular shape and the cleaning parts come in zippered bags which is protective. We like the kit as it keeps things organized and the Velcro design is well thought-out. 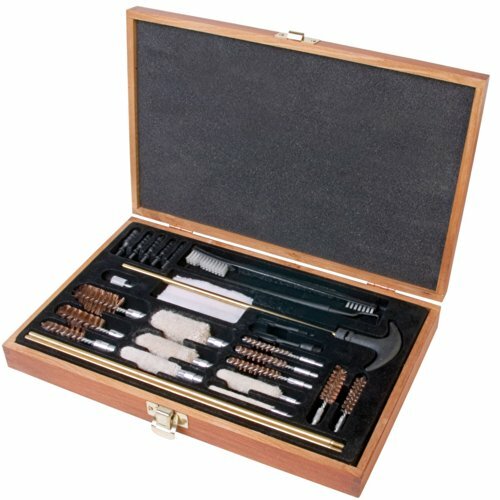 Never mind the minor issues as the kit includes all tools you need for gun cleaning, especially if you’re new at this. 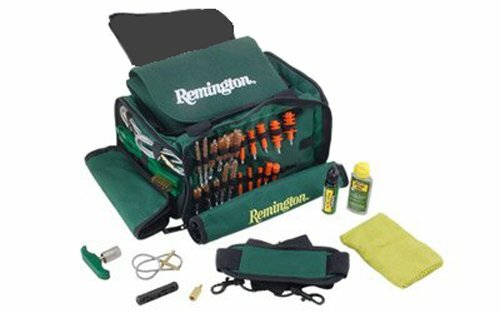 The Remington Hunting Cleaning and Maintenance Kit isn’t just a gun cleaning kit, but also an option for you to store some extra equipment, when in need. The kit features the innovative RemSqueeg-E Universal Gun Care System that contains almost anything you need to clean your firearm. The kit is quite versatile and may be used on a large variety of guns, from .22 caliber pistol or revolver to a 12-gauge shotgun. Let’s take a closer look at the Rem Squeeg-E Universal Gun Care system with the rod or cable attached pull-through bore cleaners to eliminate the patches, removing all dislodged debris. You get a clean chamber and barrel in only one easy step. The system includes ten size Rem Squeeg-Es and matching bore brushes (so many various size and types), a coated cable system in rifle, shotgun and handgun lengths. They don’t scratch your barrel and the patented Fast Snap T-handle ensures fast adaptability. The kit also includes nylon and brass brushes, Rem Pad gun mat, gun cloth, threaded revolver adapter and 1 oz. Rem Oil, along the 5 oz. Rem All in Bore Cleaner. The gun mat has Velcro and is so easy to use and store. It’s also machine-washable and well padded. The kit keeps everything organized and is well priced. It has a compact shape for easier storage/carrying. All things considered, we don’t hesitate to consider the kit a well-priced option to have for cleaning and maintaining your guns. Don’t sit on the fence about paying the extra buck for a gun cleaning kit as, when it comes to the Otis Elite Cleaning System with Optics Cleaning Gear, it’s worth it to pay it. The complete gun cleaning kit is highly versatile as it’s designed to clean all rifles from .17 to .50 caliber, pistols from .17 to .50 caliber, shotguns from .410 to 12/10 gauge and all inline muzzleloaders. The Otise Elite’s most precious features is the well-known 750 Tactical Cleaning System that includes bronze bores and chamber cleaning brushes. The system also contains six Memory-Flex cleaning rods, a T-handle bar, an all-purpose nylon receiver brush, threes slotted tips. The list is quite long and we find small and call-caliber 100% cotton patches that are absorbent and versatile, a bore reflector/flag safety and two 5-ounces tubes of Otis O85 Ultra Bore solvent. The solvent works fast and cleans deeply, protecting your gun from future build-ups just as well. The six Memory-Flex cables (various in length) let you get an efficient breech-to-muzzle cleaning, whereas the 23 bronze bore brushes for copper/other fouling removal are versatile for sure. All the tools in the kit are especially made to ensure complete and fine cleaning of all difficult to reach parts on your firearms. The Optics cleaning gear is very helpful to clean the scopes or rangefinders. The case has a compact shape and its zipper runs smooth and seems long lasting. The case material isn’t heavy, but it sure looks durable. The case is very well made and keeps your cleaning items organized and in place. The case is lightweight, easy to use and to store/carry around. In addition, in order to seal the deal, let’s also mention the kit is made in our US, which is great anytime. Nevertheless, for the versatility and reliability the kit brings, we sure think it’s a great investment for any dedicated shooter. We don’t like the Pro Shot Soft Case Super Kit only for its versatility and variety of items that includes (even though this should be enough reason), but also for its organization and well thought-out design. The kit is great to use for a wide variety of guns, from .22cal. to 12 gauge firearms. 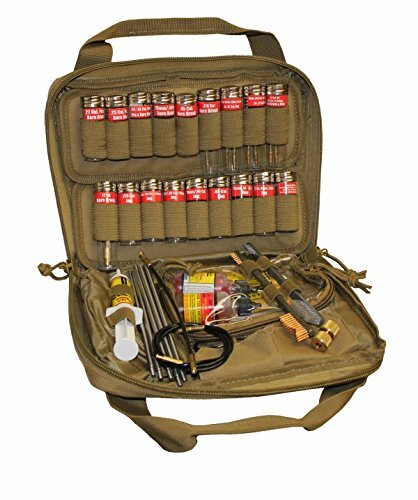 It’s a complete kit that contains various brushes, mops, jags, patch holders, adaptors, muzzle protection guard, rod stop, , double coated cleaning rod in give sections, gun solvent, gun oil and much more. The swivel T-handle is great for cleaning chambers. The plastic bottles are individually labelled so you can’t miss the right one for the job. You get to find the in the kit stainless rod sections and pull through cables. It basically includes all the cleaning accessories you need to clean any pistol, rifle or shotgun from .22 to 12 gauge. In addition, if you are counting, the kit actually lists 40 different cleaning accessories that mount directly into all cleaning rods included. You may custom lengths to fit almost any gun. Let’s not forget two tactical pull through cables (8” and 30 in) with a quick attach handle. The case also includes 1 step CLP, ZF-1 lubricant, Pro-Gold grease and silicone cloth and cleaning patches, in 4 various sizes. The kit comes in a nylon soft case with front Velcro panel, custom made pockets and holders. The zips are durable and run smooth and the carry handle makes the case highly portable. It includes two level storage space for your cleaning supplies and tools and may become instantly your cleaning station stand. It’s made in our USA so this may be essential for many. Our take aways are that, for a bit of money, you get a highly versatile, functional and reliable gun cleaning kit that has so much to offer. If you see yourself as an avid shooter that already excels in taking care of his weapons, it’s only natural that you get a gun cleaning kit that matches your skills and interests. This would be the case of the M-Pro 7 Advanced Small Arms Cleaning Kit with Leatherman MUT that is a complete gun cleaning kit and a bit more. The kit includes all the things you need to get a field and base maintenance for your guns and includes items that most soldier need for the cleaning jobs. 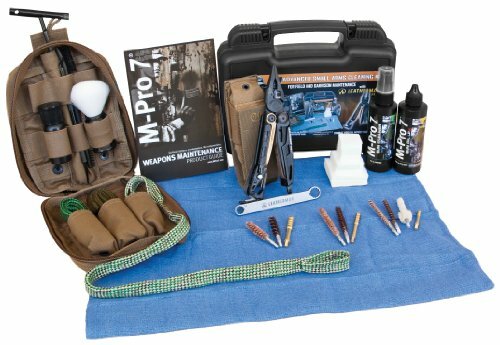 This kit is actually designed by and for the U.S. soldiers so this is why it contains everything you need to give a thorough cleaning to your weapon. The kit includes the M-Pro7 gun cleaner and the M-Pro 7 Gun oil LPX and a spare empty 1 oz. bottle with lid. The gun cleaner improves your gun performance as it removes fouling, embedded carbon and also keeps at distance future build up. The citrus smell is important to notice also. On the other hand, the M-Pro 7 oil lox protects your weapon against wear, moisture, humidity, salt water and leaves a durable film that protects against dust and dirt. Inside the lockable case (which is so important for safe and secure transportation/storage) we also see 3 bore snakes, 150 patches, 3 nylon brushes, 3 brass jags and 3 phosphor bronze brushes. All of these items aren’t just versatile, but also good quality and long lasting. Important to mention: the jags are 5.56mm, 7.62mm and 9mm. The case is well thought out and the small details to matter. For instance, a magnet pad maintains little screws and springs from getting lost when you clean your weapon. The mole-filled pouch keeps all items in place and well organized. Moreover, in case you don’t know that well how to clean your gun, the Weapon Maintenance Guide that comes along sure helps you a lot. Despite the minor issues, when you feel you are ready for the big things, don’t hesitate to get the kit as it’s totally worth it. Just because you don’t own (yet) all sizes of guns, it doesn’t mean you can’t get practical and get a universal gun cleaning kit that gets handy, no matter the size of the gun. A good example for this category is the Hoppe’s Universal Gun Cleaning Accessory Kit that sure is versatile and ready to help so many of us out there. 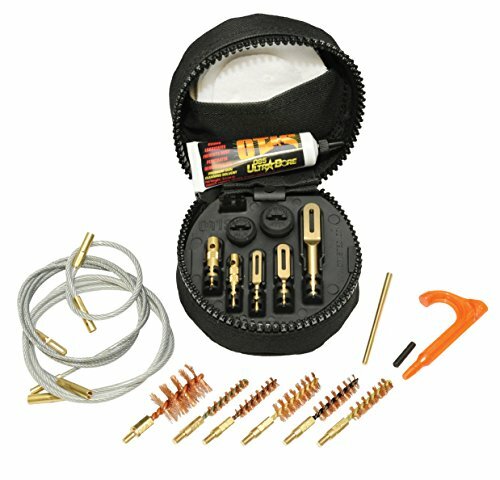 The gun cleaning kit comes with nine-shotgun phosphor brushes (for a variety of calibers) that feature stout bristles and is effective on lead. 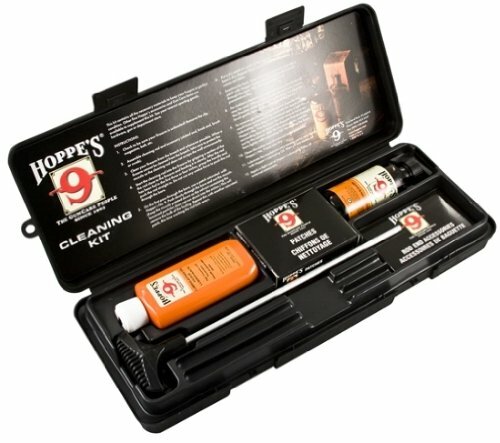 The Hoppe’s No.9 included in the kit is the most popular remover of powder, rust, lead and metal fouling. It’s highly efficient, safe and easy to use and acts fast and deeply. Its childproof cap makes it safe to have it around kids also. We find in the kit the Hoppe’s No.9 Synthetic Blend Lubricating Oil that keeps all areas of your firearm well lubricated and protected. The oil minimizes wear and tear and protects the gun against corrosion and moisture. The aluminum-cleaning rod features a ball bearing swivel handle so that you get to follow the bore’s rifling. As for the included Bore Snake, we can sure say it’s fast and efficient. The slotted ends may be used with patches and are compatible with all Hoppe’s cleaning rods. They are made of high quality materials. The kit includes so many items for cleaning that you may use on so variously sized guns. All in all, for a fair price, you get a reliable, universal gun cleaning kit that comes helpful in many situations. Even though it comes with some drawbacks, you get a pretty reliable and versatile gun cleaning kit with the Otis Tactical Cleaning System with 6 Brushes. The kit includes efficient memory-flex cables that come in three sizes: 8 inches, 30 inches and 34 inches. You may use the cleaning kit for various guns from .17 to .50 caliber, no matter if they are pistols, rifles, shotguns or inline muzzleloaders. For your gun cleaning, you may also use one of the 6 firearm specific bronze bore brushes or the T-handle and obstruction removal tools. The kit also includes all-caliber cotton cleaning patches for 0.270 caliber and larger. All things are well packaged and organized inside the case. We also like the kit, as the case is soft, yet durable and lightweight. The belt loop makes it easy to carry around, comfortably. The minor issues aren’t deal breakers for us though and we think the kit is a good quality option, considering its price. 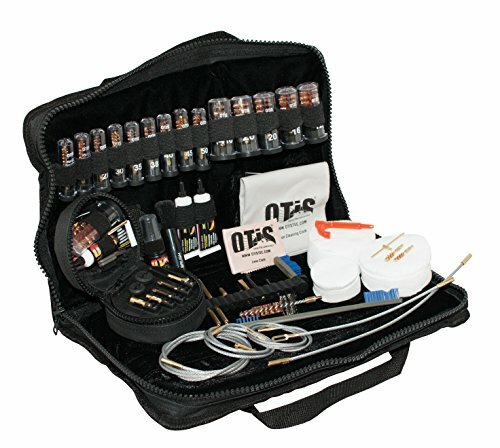 Just because it’s universal, it doesn’t mean that the Outers Universal 62-Piece Blow Molded Gun Cleaning Kit doesn’t make the cut as a great option for your 9mm. The gun cleaning kit sure contains a wide variety of tools, in so many sizes. The versatility of the tools make the kit reliable for use on many types and calibers. The kit actually contains tough, solid brass rods with high-quality tips, mops, brushes and patches. The case features variously sized compartments for easy and organized access. Every single piece of the kit has its specific slot, which makes organizing so much easier. The case features a nice, well thought out design. The case has a solid build and the lid latches securely on both sides. As it comes with a functional assortment of tools, the kit is a great choice for many guns, including the 9mm.